Cyclists compete in ninth stage. HCM CITY (VNS) — Nguyen Thanh Tam had no rivals in the last dash as he finished first at the ninth stage of the HCM City Television Cycling Cup yesterday. 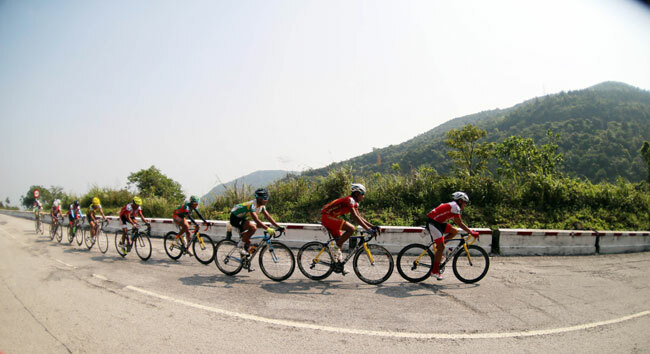 Tam of An Giang's Gao Hat Ngoc Troi team, clocked 2:49.48 in the 115km race from Hue City to Da Nang City. He was followed by Le Van Duan of HCM City's VUS and Ho Van Phuc of ADC-Vinh Long Television. Although BTV Binh Duong's Nguyen Minh Viet didn't finish in the top three, he won the yellow jersey with the best overall time after nine stages at 21:32:44. He was followed by Quang Van Cuong of Ha Noi and Tam's teammate Nguyen Hoang Giang. "I am very glad to get the yellow jersey and I will try to defend it," Viet said. Duan continued to hold the green jersey as best sprinter with 72 points. The red jersey as king of mountain went to Nguyen Tan Hoai of Domesco Pharmacy Dong Thap.